Ask most elementary school children what the difference between a triangle, a square, and a pentagon is, and they’ll be able to tell you with ease. Shapes are one of the easiest mathematical concepts to grasp, and among the infinite number of possible polygons, shapes with three, four, or five sides are the most basic. However, beyond the simplest, most child-friendly definition of a pentagon—“a shape that has five sides”—lurks a problem complex enough to have stumped mathematicians for nearly a century. One of the special properties ascribed to triangles and quadrangles (all four-sided shapes, including squares, rectangles, rhombuses, and parallelograms) is their ability to “tile the plane,” i.e. perfectly cover a flat surface, leaving no gaps and creating no overlaps between each identical shape. Finding a real-world example can be as simple as glancing down at the kitchen or bathroom floor, where regular ceramic or linoleum shapes form a smooth, unbroken pattern, sometimes called a tessellation. Although a regular pentagon (one in which all five sides and all five angles are of equal measure) can’t tile the plane, German mathematician Karl Reinhardt broke new ground in 1918 when he discovered equations for five non-regular pentagons that could, in fact, cover a flat surface sans gaps or overlaps. 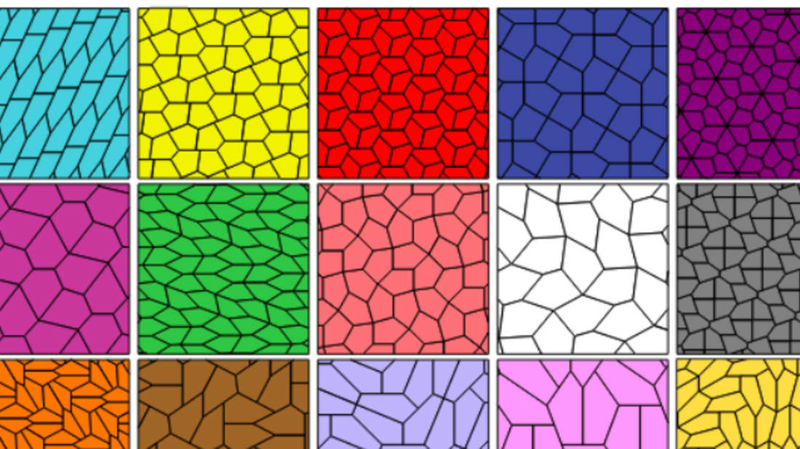 This introduced the possibility that there might be even more irregular pentagons out there capable of tiling the plane, if only someone could discover them. From 1968 to 1985, various contributors added to the list of tiling pentagons until there were fourteen known varieties. Those fourteen stood alone until a recent breakthrough at the University of Washington Bothell that added a fifteenth. Married research team Jennifer McLoud-Mann and Casey Mann of the university’s School of Science, Technology, Engineering and Mathematics had been working on pentagon tiling for two years prior to their recent discovery, but it took the special expertise of a third team member to bring the fifteenth pentagon to light. David Von Derau arrived at the University of Washington Bothell seeking an undergraduate degree, but brought with him years of experience as a professional software developer. McLoud-Mann and Mann recruited him to their project, provided him with their algorithm, and Von Derau programmed a computer to do the necessary calculations. McLoud-Mann had already eliminated a number of false positives—mathematically impossible pentagons or repeats of the 14 previously discovered types—when the computer finally turned out one that was the real deal. According to Mann, the discovery of a 15th tiling pentagon is as major for mathematicians as creating a new atom would be for physicists. A new tiling shape may lead to developments in biochemistry, architecture, materials engineering, and more. With an infinite number of irregular pentagon forms, there could be an infinite number of them that tile the plane. When asked if the team would continue their potentially never-ending quest for more tiling pentagons, McLoud-Mann admitted she simply didn’t know; after all, working through a problem that never ends must take its toll on even the most dedicated researchers. For anyone willing to take up the mantle, so far that’s 15 pentagons down, possibly infinity more to go.